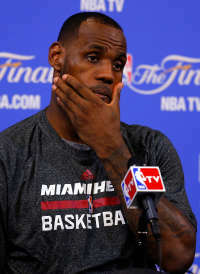 Comments: Comments Off on Is LeBron the best NBA player EVER? Maybe! 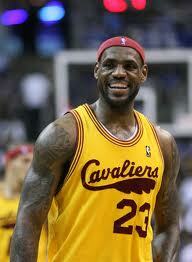 Is LeBron the best NBA player EVER? Maybe! NOTE: NOTE: On NNR Samantha Bunten of NBC Sports and I talked about game 1 of the NBA finals. The Cavs’ “big 3” has turned into LeBron James and a bunch of “guys.” The injury to Kyrie Irving was a serious blow to the title hopes of the team but was not unexpected by Cavs fans. Despite a world of talent, there is an injury history that makes fans wonder when and not if Irving will be gone for the season. Irving played a hand full of games at his only season at Duke before being hurt. In his rookie year he played in only 51 games due to injuries. In his second year he got into 59 games again due to injury. So his injuries in the 2014-15 season were not a shock to us. Nor was the injury to C Anderson Varejao who went down again this season. Andy has been healthy in only 2 of his 11 seasons with the Cavs. Now James faces a very high scoring Warriors team with what is left on the roster. Paying the big 3 limited the amount of money that the Cavs had to provide a solid bench. Bench scoring has been erratic at best this season. Now without both Kevin Love and Irving, it becomes much more important. Timofey Mozgov scored above his average in Game 1. While Tristan Thompson had 15 rebounds, he needs to score more than 2 points to give the team any chance of winning. In addition, J.R. Smith and Iman Shumpert have to score more and do a better job of shot selection. But that brings us back to the question—Is LeBron James the best player ever in the NBA? If he can over come the injuries the team has sustained this year he will have accomplished something that few super star players in the league have—to lead 2 different franchises to titles. And if LeBron can lead the Cavs to a title given these injuries, he deserves that honor.